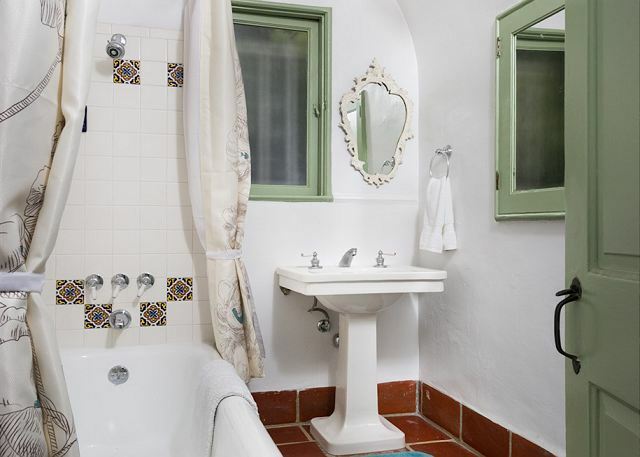 Villa Valentino #11 is a one bedroom, one bath apartment built in the 1920’s in the heart of Hollywood. It has been recently restored and fully furnished. It has a private courtyard with fountain with access from both bedroom and living room and a cozy gas log fireplace in the living room. 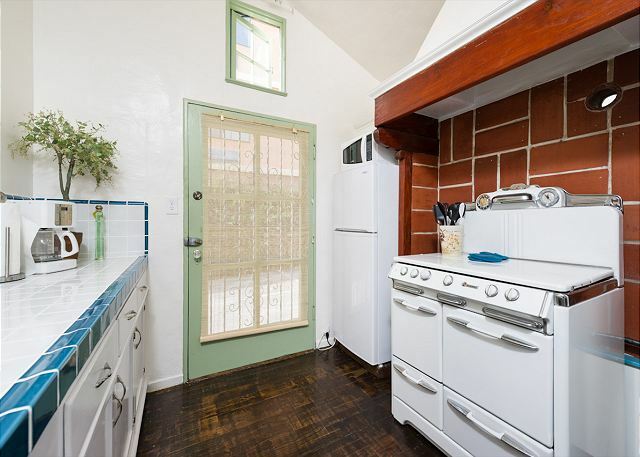 The vintage range in the kitchen adds to the ambiance. Off-street parking. 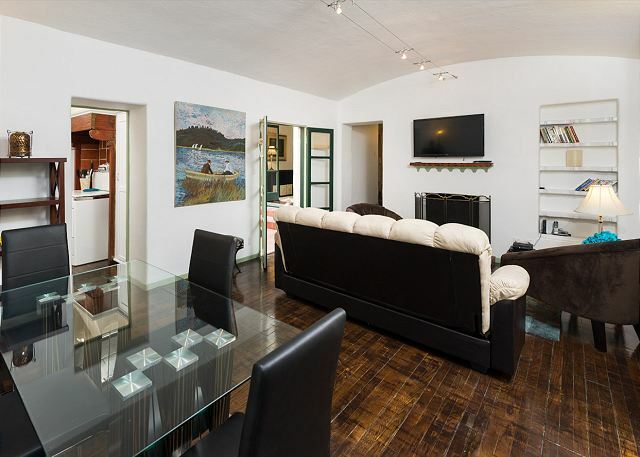 This fabulous property is located just 2 blocks south of the Hollywood Bowl, and 2 blocks north of the “Heart of Hollywood” district at Hollywood Blvd and Highland Ave. Easy walking access to Disney’s El Capitan Theater, the Kodak Theater, Graumann’s Chinese Theater, the Metro station, restaurants galore and many other attractions. Close access to the 101 Freeway. Designed by the Davis Brothers Architects, Villa Valentino is designated as Los Angles City Cultural Monument #397, and is one of the best remaining examples of the Garden Court style of architecture from the early 20th century. It is a hidden gem. Step back in time. My husband and I stayed in this gorgeous villa for five days. Out trip to LA was a 20 year wedding anniversary gift to ourselves. We've stayed at dozens of VRBO properties in many major cities. This flat is one of our favourites. The apartment was impeccably clean and tastefully decorated and we loved the many charming shared courtyards throughout the complex. We also really enjoyed chilling in our own private patio - replete with a fountain. The main reason we loved our stay however is because of the people who work there. Carrie is a lovely hostess and the cleaning and grounds workers are all delightful. We will be back many times! Loved the 20s era apartment! My sister and I selected this for our stay during the TCM Film Festival. It was easily within walking distance to everything, safe and secure and a LOT less expensive than the Hollywood Roosevelt. We particularly enjoyed the ambiance of the architecture and décor - fitting for the viewing of classic films. We will absolutely return to Villa Valentino next year! A little oasis tucked away amidst a vibrant and active neighborhood. Peaceful, relaxing, and comfortable when enjoying our limited down time at the Villa. Close to everything either by car and foot. It was a charming apartment! We loved the furnishings, fresh linens and everything we needed was provided. 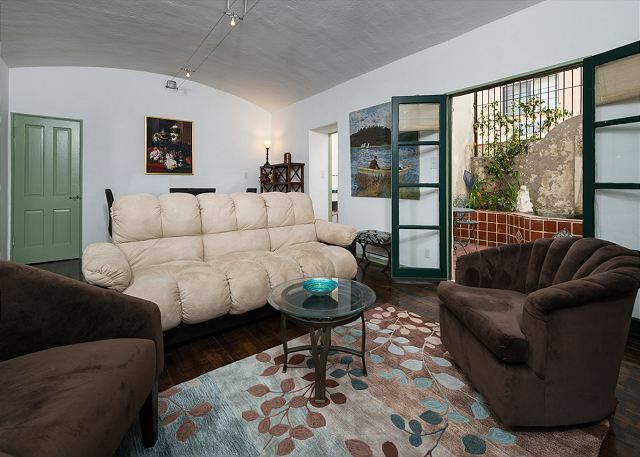 It was a great location away from the noise but within walking distance of Hollywood Blvd. 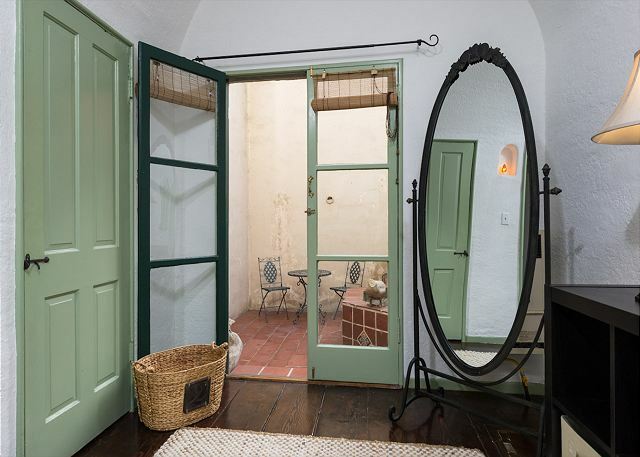 Great place to stay, with old word Spanish charm.Units are all self contained with every thing needed to enjoy your stay while cutting back on the expense of dining out.Tucked away of the main road, only several hundred meters from Hollywood Boulevard and the walk of Fame. This was a wonderful find! It is charming and the villas are restored perfectly, combining the modern day conveniences we are all used to but keeping the history intact. It is like a small village tucked away from the LA madness! The best Hollywood has to offer!! This was a great place to stay, right in the middle of everything. I loved the historic feel of the place with the upgraded amenities. The fountain and private courtyard was lovely place to enjoy. We found Carrie very helpful. The property was clean and ideal for us. Great location, we only had to walk a short distance to the walk of fame and centre of Hollywood. Everything we were expecting. Just disappointed the weather wasn't better to enjoy the garden and B-B-Q area. I loved Villa Valentino #11. It was quiet, charming and comfortable. I loved all the quirky vintage touches in the apartment. Very clean with everything I needed. I'm not fond of the area around Hollywood but have to go for a work commitment on occasion. My stay here helped make my trip much more pleasant. Carrie was wonderful. My partner and I had the best time ever in LA at this charming apartment. The location is perfect. We could have passed it up it is so hidden from the street. It was like a oasis in the middle of Hollywood. I want to retire there. I loved cooking almost all our dinners on the old fashioned stove. The fireplace was romantic. The bed was soooo comfy, and our friend said the sofa bed was surprisingly cozy. I was a little uncomfortable that there isn't a door to the bedroom, but we managed. The private patio with fountain was awesome to entertain, and the sound was pleasant in the bedroom. We had no problems at all and if we did I felt very comfortable with Carrie, she was the best property manager, and her dog Tegan was so cute and a little piece of home since we didn't bring our dog. The courtyard with the plants and palms all the tables and chairs are well kept and our company we entertained was in awe of the beauty day and night. The Laundry room was kept clean and easy to get to. Parking was good. It wasn't extra like hotels charge. We can't wait to come back with friends. This place is unlike any other. Cecilia and Scott were wonderful and made sure we had everything we needed or knew where to get it. The moment you step through the front gate is like entering the Secret Garden... it truly is a gem hidden away among the hustle and bustle of Hollywood. The apartments are amazing - I wish I could move in permanently! With just a short walk you are on Hollywood Blvd, or at the metro station, and have everything at your fingertips. If you need to get somewhere the metro will not take you, Uber is always nearby. I will most DEFINITELY be staying here again anytime I am in the Los Angeles area. So glad I found the Villa Valentino. My husband and I stayed in unit #11 for 5 nights over Thanksgiving. It was truly a home away from home. Central location, safe, super clean, very comfortable, and had everything we needed, including gated parking. Carrie, who let us in and showed us around, was friendly, informative, and accommodating. The gas fireplace was put to good use, as it was chilly in LA that weekend. The courtyard is adorable and has many places to hang out with bbq grills. The only drawback, and it's something that nobody can fix, is that it's difficult to get in/out of the driveway because it's on a very busy street. That was minor though. We loved our stay and would definitely return. I've traveled a lot and stayed at various highly acclaimed establishments and while Hollywood Hideaways may not have the around the clock service or amenities that a five star resort offers it has something that in my opinion is so much more special - personality and character. This place is authentic hollywood. 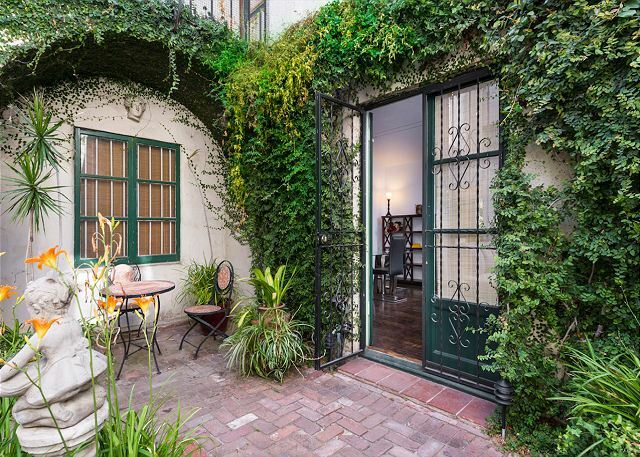 I would describe it as an old school italian home in the middle of wine country shoved into the middle of hollywood hidden away by ivy and an unassuming doorway. 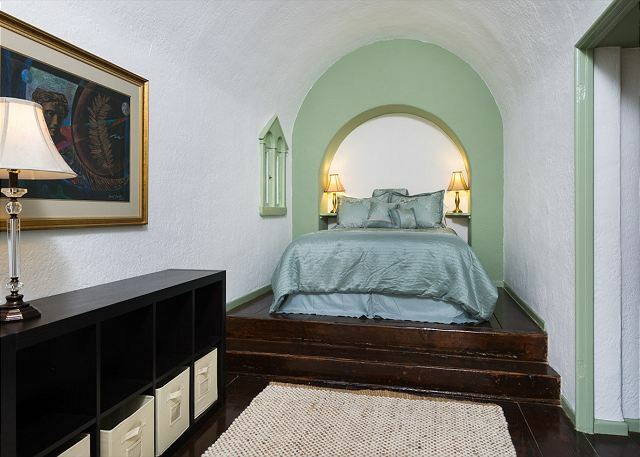 It has a truly unique feel to it and not to mention the rooms are beautiful and very well renovated (it is one of the oldest properties in hollywood!). 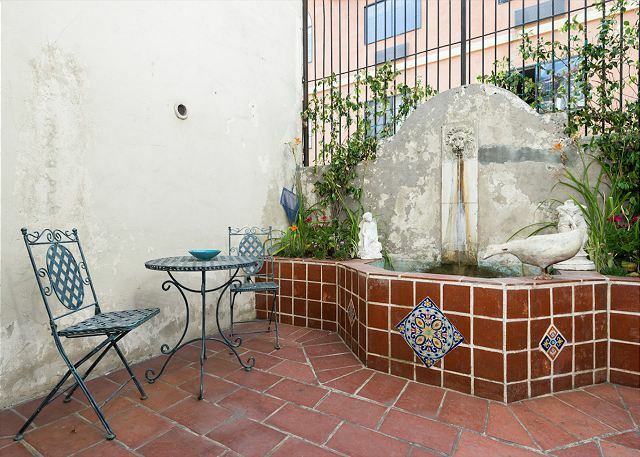 There is a private fountain/courtyard for your morning cup of joe as well as tons of shared courtyard space that feels like your own. Highly recommend. My husband, son and I stayed in Villa Valentino #11 for a week this July. We frequently visit Hollywood, and this was one of our best stays. Though located on busy Highland Ave., our location at the back of the property was quiet. It was "old Hollywood" in every way, from the niche lights to the 2 outdoor seating areas. We had everything we needed, and Carrie was wonderful when we had questions. We wouldn't hesitate to stay here again! When choosing a place in LA we read the reviews and people spoke about the quietness. It is TRUE. When the gate closes behind you, your world changes. We felt like we were in Europe and relaxing on a quiet walk. The condo is so sweet. The fountain added a relaxing sound and the outdoor spaces added an extra dimension. We made breakfast each morning--shopped at Ralphs. Laundry room was so clean. We slept soundly and were so pleased with everything. Carrie is very helpful! Hope to return! My kids and I recently visited California and enjoyed our stay at the Villa. Carrie was a wonderful host and the location was close to where we needed to go. It was tucked away in a quiet and private area. Close to walk and pretty central to all the sites we visited. The room itself was very nice and the walkways were very pretty. Would recommend for a quiet stay. Villa Valentino is dripping with charm and character. A refreshing change from the glass box I live in. Carrie is very pleasant and helpful. As I did not have a car, It's a bit of a hike to a grocery store and down to Sunset Blvd especially in hot sunny weather. I've stayed in these apartments many times and they are terrific. The bed is the best ever!! This is a one bedroom, but there is a pull out sofa bed which is very comfortable. Every one is really friendly and the manager very responsive to any question, problem. It's on o major road, but you never hear the noise when you are inside -- it is an oasis in the middle of busy Los Angeles. And it's very centrally located and near public transportation. I must like it because I am already booked in for two more stays!. There is nowhere better to stay. Its just around the bend from Hollywood Boulevard however once you are through the gate you could be anywhere. Its still being renovated so don't judge it until you go through the second gate. Private courtyards, water features and public areas are beautiful. Carrie & her dog Tegan were the perfect hosts. I cant recommend this place enough. We stayed in no. 11 but looked at a few others and they are all equally as beautiful. Perfectly located near the Dolby Theater and Chinese Theater, don't think twice, stay here you wont regret it. We were there for 2 weeks after spending 5 weeks travelling and it felt like we were home even though home is Australia, a very very long way away. Thanks Carrie it was amazing. On a final note it was the only place I stayed that I felt was clean enough to have a bath. Loved, loved, loved it. Carrie & Scott have a hidden gem in the middle of Hollywood. 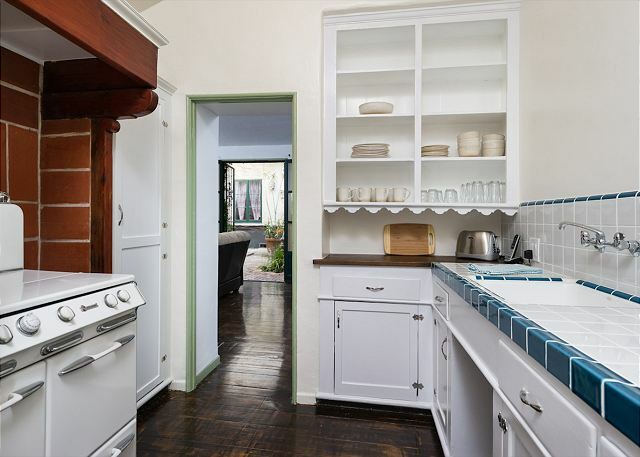 It has all the vintage charm of 1920s Hollywood. Well kept & well furnished. Other folks staying there made it feel like a neighborhood you've been in for years. Its going to be my "home away from home" when I come to LosAngeles for work. Beautiful apartment- we didn't want to leave! Carrie and Scott were so helpful and accommodating. I'll be staying here the next time I'm in LA! I felt overwhelmed by the desperate nature of Hollywood. I was there working for a month and aside from the history, and some of the fabulous architecture, I felt like I was in Times Square every time I came close to Hollywood Blvd. But the Hollywood Hideaway experience made me forget all of that. 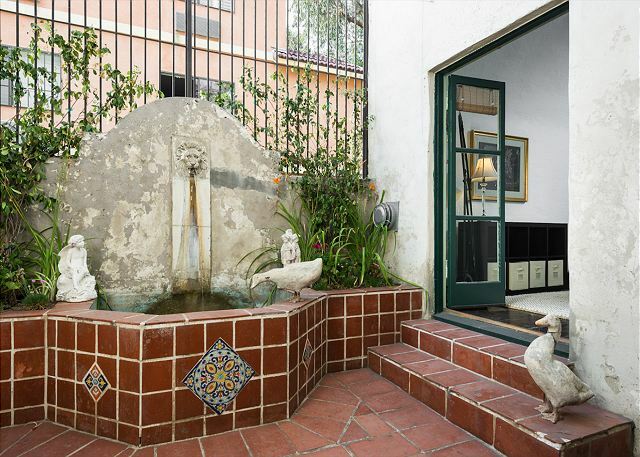 The gurgle of fountains, the multiple places to sit in quiet courtyards, and my perfect apartment sheltered me from the melee of Los Angeles just outside of the gate. You would never know that the crowded freeway was just a few blocks away! I would go back in a minute, and I hope I can! We had such a wonderful time staying at Villa Valentino. The location was perfect for everything we wanted to do while staying in Los Angeles and the apartment was perfect. It had such charm and character. The property manager was friendly and accommodating but gave us space. I will be staying here again on our next trip and recommending to my friends as well. Thank you for a perfect stay. This property was very well maintained, neat, clean, and full of character! The amazing stay began before we even left home with the owners. Carrie was super nice and personal. Her service was just enjoyable and wonderful. We felt like she was a new friend by the time we left. Having her on site was great! The place was decorated wonderfully. The court yards were full of trees and plants and quiet even though on a busy street. Peace and serenity abounded. Even the maintenance staff were super nice and helpful. We recommend this place to everyone. 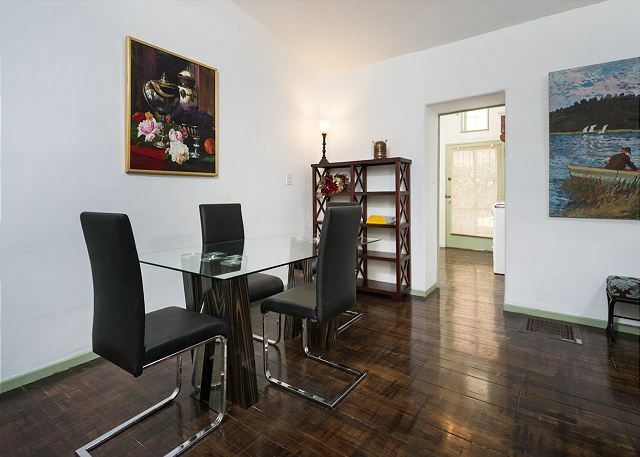 Wonderful first floor apartment with a private patio in the heart of Hollywood! Its my second time here (stayed for 30 days in May-June 2013 and again for 19 days this year, and I love it! The place was awesome and Carrie was the nicest manager ever. Would definitely rent this place again. A hidden gem. We thoroughly enjoyed our cozy 1920's bungalow at Villa Valentino. Our apartment was clean and roomy. We had patios off of the bedroom and the living room. Our February weather was cool so we had the gas fireplace on every night. About 10 of us from my company rented apartments at Villa Valentino, and everyone was very pleased. Each apartment is different and has its own charm. Renovations were going on, but they did a good job to keep the noise and disruption at a minimum for residents. Great location. Wonderful to have a manager on site to deal with small stuff. Would definitely recommend to others (and I have!). A bunch of us from our company all rented apartments in the complex for our 11 week stay. We enjoyed the property, the sense of community, the history and detail of the apartments, and the obvious care that has gone into restoration. Renovations were still in progress during our stay, but they did a good job of keeping the noise and disturbance to a minimum for us. The location is terrific, very convenient to everything in Hollywood. This would be the most enjoyable stay I have had in a very long time. Magnificent property, wonderful on site management and all secluded in the very heart of Hollywood. If you are looking for accommodation and don't choose this you will regret your decision. A real jem that felt like home. I will not stay anywhere else when I visit LA in the future. Historic building is cozy and full of character. Made our first vacation to LA truly memorable. It's great that this splendid property is being so lovingly preserved. Location was convenient to everything. We always felt safe and secure. Carrie was wonderfullly helpful and knowledgeable about Hollywood. #11 was immaculate and restored beautifully, with plenty of space. Secure off street parking was a plus. We will be visiting again and plan on staying at the same property. Convenient, Very Comfortable, Great Value! I needed a spot to stay while helping my daughter begin her college adventure. This was like a having a home away from home for the short time we were there. Great spot, wonderful people, professional and friendly. A delightful experience! I'll stay there the next time I'm in Hollywood. If you want to stay in a beautiful villa that was originally built by the movie studios to house their actors, this is the place. When my family vacations we usually stay at the Hyatt or some property similar to that. We ventured off to and came across this gem. This building is being restored, returning its to 'old hollywood glamour' living. The gardens and ponds/fountains are beautiful. Its minutes from Universal Studios. It is also walking distance to the Hollywood "walk of fame" and hiking trails. We will be returning to the villa valentino on our next trip to LA. This apartment was extremely lovely and clean. Good location for all in Hollywood. The surrounding property, ie. entrance and outside grounds of property was horrible. I know they are remodeling but there was much cleanup they could do to minimize the horrible exterior. They desperately need to reconfigure parking. It was a nightmare and I understand parking in LA is at a premium, but if they cleaned up the grounds, better parking for renters would be available. A hidden gem, centrally located, clean but funky, steeped in character. 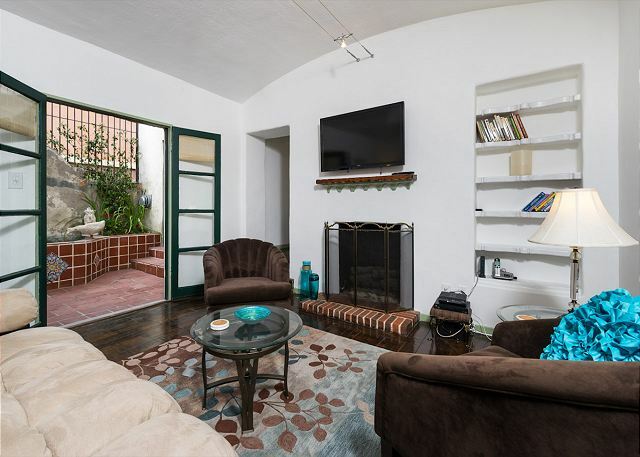 Situated in the heart of Hollywood, the apartments are set around a lovely tree filled courtyard where it's surprisingly quiet. Ideal for exploring Hollywood on foot, or with parking available, convenient if traveling by car. We spent 10 days and intend to return on our next visit. Absolutely loved the villa style of the apartment. Very quaint and comfortable! Was especially impressed with how the kitchen was equipped and the nice linens in the bathroom. We had a very relaxing stay and really enjoyed having our breakfast in the patio courtyard. We will definitely stay here again on our next trip to L.A.
My wife Lynn and I could not have been happier with our delightful apartment in the heart of the Hollywood fun district. If you are looking for a relaxing step back into the past while at the same time staying in a beautifully renovated apartment...then look no further. This is the place for you. The pictures do not do it justice. The feeling after driving through the secure gate and into the courtyard is almost indescribable. While the hustle and bustle of midtown Hollywood lie only steps from the entrance to the complex, once inside its walls you feel thousands of miles away and a century back in time. Inside our apartment and outside in our own little garden area we felt so relaxed that at times we forgot where we were and in what century we existed. Carrie, the property manager, made us feel as though we were part owners of the facility while at the same time offering whatever assistance we should need (although we needed nothing). I can't imagine anyone even considering a hotel room for a 3 day stay or more with this gem at their disposal.